Sarah Smolnicki of St. Hubert High School, Philadelphia. Sarah Smolnicki of St. Hubert High School won first place in the ninth-grade division of the Ryerss Museum and Library Poetry Contest. The results of the contest for high school students in four grade levels, were announced March 17 by Ryerss’ poet in residence, Diane Sahms-Guarnieri. 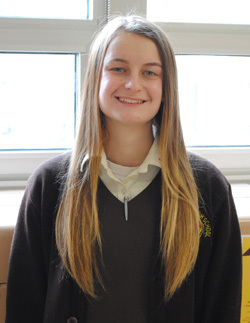 Smolnicki is a freshman at the all-girls school in Northeast Philadelphia. St. Hubert’s was the only Catholic school to win an award in the contest. See the full list of winners here. A youth poetry reading will be held in honor of the winners and National Poetry Month on April 5 at 1 p.m. in the second floor gallery of Ryerss Museum and Library. It is located in Burholme Park, 7370 Central Avenue in Philadelphia. Readers will include first, second, third and honorable mention winners in each grade category. The reading is free and open to the public.